Fotis Topouzis is an Assistant Professor of Ophthalmology, Head and Founder of the Laboratory of Research and Clinical Applications in Ophthalmology, in the A’ Department of Ophthalmology at the Aristotle University of Thessaloniki, Greece. 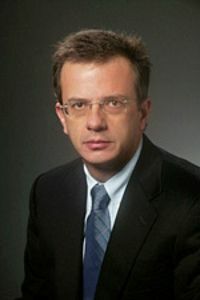 He completed his glaucoma fellowship at the Jules Stein Eye Institute, Los Angeles, CA, USA, and has since received numerous awards, including a Post-Doctoral Award from the Aristotle University of Thessaloniki, and the Shaffer International Fellowship Award from the Glaucoma Research Foundation, San Francisco, CA, USA. Dr. Topouzis is member of the Executive Committee of the European Glaucoma Society (EGS). He is also Secretary of GlaucoGENE, a special interest group of the EGS, and a member of the editorial board of the American Journal of Ophthalmology. He is principal investigator in many studies, among which are two large population-based studies—the Thessaloniki Eye Study and the EUREYE Study, and coordinator of the EGS GlaucoGENE Project. His research interests include ophthalmic epidemiology, risk factors for glaucoma, genetic epidemiology in glaucoma, imaging, glaucoma surgical and medical management, and age-related macular degeneration. Founti P, Topouzis F, van Koolwijk L, Traverso CE, Pfeiffer N, Viswanathan AC. Biobanks and the importance of detailed phenotyping: a case study - the European Glaucoma Society GlaucoGENE project. Fletcher AE, Bentham GC, Agnew M, Young IS, Augood C, Chakravarthy U, de Jong PT, Rahu M, Seland J, Soubrane G, Tomazzoli L, Topouzis F, Vingerling JR, Vioque J.
Sunlight exposure, antioxidants, and age-related macular degeneration. Augood C, Chakravarthy U, Young I, Vioque J, de Jong PT, Bentham G, Rahu M, Seland J, Soubrane G, Tomazzoli L, Topouzis F, Vingerling JR, Fletcher AE. Oily fish consumption, dietary docosahexaenoic acid and eicosapentaenoic acid intakes, and associations with neovascular age-related macular degeneration. Am J Clin Nutr. 2008;88:398-406. Topouzis F, Coleman AL, Harris A, Koskosas A, Founti P, Gong G, Yu F, Anastasopoulos E, Pappas Th, Wilson MR.
Factors associated with undiagnosed Open Angle Glaucoma. The Thessaloniki Eye Study. Topouzis F, Wilson M.R., Harris A, Anastasopoulos E, Yu F, Mavroudis L, Pappas Th, Koskosas A, Coleman A.L. Prevalence of Open Angle Glaucoma in Greece. The Thessaloniki Eye Study. Topouzis F, Melamed S, Danesh-Meyer H, Wells AP, Kozobolis V, Wieland H, Andrew R, Wells D. and the International Travoprost/Timolol study group. " Topouzis F, Coleman AL, Harris A, Anastasopoulos E, Yu F, Koskosas A, Pappas T, Mavroudis L, Wilson MR. Prevalence of age-related macular degeneration in Greece. The Thessaloniki Eye Study. Augood CA, Vingerling JR, de Jong PT, Chakravarthy U, Seland J, Soubrane G, Tomazzoli L, Topouzis F, Bentham G, Rahu M, Vioque IS, Fletcher AE. Prevalence of age-related maculopathy in older Europeans: the European Eye Study (EUREYE). Topouzis F., Coleman A.L., Harris A., Jonescu-Cuypers C., Yu F., Mavroudis L., Anastasopoulos E., Pappas Th., Koskosas A., Wilson M.R. Association of blood pressure status with the optic disc structure in non glaucoma subjects. The Thessaloniki Eye Study. Topouzis F, Tranos P, Koskosas A, Pappas T, Anastasopoulos E, Dimitrakos S, Wilson MR.
Risk of sudden visual loss following filtration surgery in end-stage glaucoma.